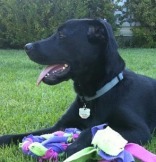 Colette is about a year old and a black lab mix. She is a sweet girl who is only about 40lbs. She has attended obedience training and has sailed through. She gets along well with other dogs and loves people. She is also showing promising signs of potty training so may just need a quick refresher course. Colette is a sweet, silly girl will cover you in kisses if given the chance. Colette is thankful to have found a home for the holidays! She was adopted by a couple in San Jose. Namita is one of three beautiful sisters who arrived from Merced. She is estimated at about 5/6 months old, approx. 25lbs, and a mix of German shepherd and most likely Sheltie. She is a playful girl who likes to romp and play and sneak in a quick kiss here and there. She is quickly learning the proper way to walk on leash along with other basic commands and potty training. She is definitely the more outgoing girl of the bunch and is ready for a new fun life. Namita has found her new forever home with a woman in a Petaluma. Hope is currently about 1.5 years old and was labeled as a shepherd/lab mix when she and her brothers, Hercules and Finn, were rescued from Bakersfield back in August of 2009. Since then a doggie DNA test has been done showing that she is husky, pointer, boxer and pomeranian. She is currently about 70lbs. She can be shy and submissive in new situations so will need a patient, loving family to help her build her trust and confidence. Hope rides well in the car and knows her basic commands. She learned new commands everyday in her foster home such as "bed" and even cries at the back door to go potty. Check her out in action here - http://www.youtube.com/watch?v=XpcGG8NOZ5k She has been making regular trips to the dog park and everyday comes a little closer to letting loose and just having fun. She doesn't mind sharing her toys and food with others and is very eager to please whenever treats are involved. Hope is getting a fresh start with her new family in Sunnyvale, where she'll live with children and a cat. Oliver may just be the best looking hound dog out there. 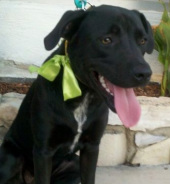 He is estimated at only about 2 years old and may be mixed with a lab. He gets along amazingly well with other dogs and is a mellow, quiet boy. He enjoys getting attention and wants nothing more than a great family to constantly love on him. He gladly greets every new person and dog with a big grin and wagging tail. He also walks fairly well on a leash and is so far showing promising signs of house training. Oliver can be a little hesitant in new situations so will need someone with patience. Another dog in the home would be excellent for him, since he is a big follower. Sweet Oliver is starting the next chapter of his life with his new "mom" in San Jose. Meet Mighty Mo! He is an adorable 2-3 month old terrier mix. He is a plump, healthy little boy with a frisky little playful temperment. He does well with dogs of all sizes and just loves to play. He also is used to sleeping in his crate and doesn't mind it one bit. Mo was adopted by his foster parent and is living with another dog in San Francisco. Laila is a reddish-brown lab mix rescued from Merced. We like to consider her a "mini lab" as she is actually on the small side. She is currently estimated at about 7 months and her foster says she is the perfect dog. Laila loves everyone - people, cats and dogs of all sizes. She doesn't mind sharing with others either. She is proven to be very smart and is quickly learning all about crate training and potty training. She is a fun girl who will make the perfect addition to any family. Laila has found her forever home with a family in San Jose. Brody is a 5/6 month old pit mix who is as sweet as they come. He literally only had hours to live, simply because there was no space left at the shelter, before Copper's Dream gladly stepped in to rescue him. Having just been rescued, Brody is a little unsure about new experiences right now, but with some gentle reassurance he acclimates quickly. He has not shown to be food or toy possessive, and loves to wiggle into your lap and get close for a cuddle (where he's happy to stay for a nap!). He was completely mellow in his bath and now his beautiful brindle coat really stands out. Here's a video of him after his bath: http://www.youtube.com/watch?v=Zpul_52uCH0. Brody is already walking well on leash and knows how to "sit." Brody gets along well with other dogs and people but needs some confident coaxing to assuage his initial unsureness. Brody's gentle, sweet temperament would make him an ideal companion for any loving family. Brody has found that loving family in San Carlos, where he is living with another dog and two children. Daisy is an approximately 1-year old black Labrador retriever mix, weighing about 40 pounds, who was rescued from Merced. Daisy, like her brother Harry, likely is part-Collie given her darling face. She is a super friendly pup, with a sweet and energetic nature. She will need lots of exercise to keep her happy and healthy. Daisy gets along with people and dogs alike. She also loves kids and just lights up everytime she gets to spend time with them. Daisy's new home is in San Francisco where she gets to live and play with two other dogs. Ryan is one of three beautiful sisters who arrived from Merced. She is estimated at about 5/6 months old, approx. 20lbs, and a mix of german shepherd and most likely sheltie. Ryan is currently on the shy side, but when she goes on a walk she's jaunty and her tail is waggin'! Once you've been introduced she doesn't turn down pets and affection. She will continue to come out of her shell with the help of loving people and continued exposure to new experiences. She likes the company of her sisters, so would probably do well and gain confidence in a home with another dog. She is quickly learning the proper way to walk on leash. Sweet little Ryan is now living in San Francisco in a home with another dog. Mia is one of three beautiful sisters who arrived from Merced. She is estimated at about 5/6 months old, approx. 25 lbs, and a mix of german shepherd and most likely sheltie. She is getting along with her foster's dog and loves to follow her foster around to be close. She's still adjusting to life outside the shelter, but is quickly adjusting to the noises of "life in the big city." Mia loves to cuddle and is looking for reassurance as she starts the next chapter of her life. She is coming along with her potty training and has learned how to sit already. Mia was adopted in time for the holidays to a home in Santa Clara. Meet Edgar a quiet gentle soul of a man. Although estimated by the shelter at approximately 1-year old, it seems he may be closer to 4 - 6 years or so. A more accurate description of his breed may also be Jack Russell and Dachshund rather than just Chihuahua. He is a special guy who was rescued from Merced. He is a super sweet guy who tolerates other dogs, but really enjoys human companionship. He definitely gets attached to those he loves and trusts. He is still a little nervous in big crowds and noisy environments so a quieter home would be ideal for him. Edgar found an adoptive home to match his mellow personality, and he's now living in San Francisco. Niko was rescued from Merced after being found as a stray. He is estimated at about 1 - 2 years old and believed to be a pomeranian mix possibly with american eskimo. He is definitely in the spitz family and probably about 20lbs. He is the perfect size to easily be your jogging partner or lap dog. He is a friendly boy with a constant grin always looking for new people or dogs to meet. He would be happiest with regular exercise and being able to join in the family activities. After Niko had a nice bath and a little TLC to his coat, he transformed into a gorgeous boy who will surely catch anyone's eye. Niko now lives with a family in Pleasanton with two teenagers. McKenna is about 8/9 months old and chihuahua/terrier mix. She is currently under 15lbs, just the perfect size for any environment. She is a very sweet girl who loves to spend time cuddling and doesn't even mind being held. She was rescued from a rural central valley shelter where she passed her temperament evaluation with the all the highest marks possible. 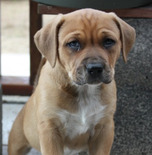 She has plenty of puppy energy and loves to roll around in the grass and enjoy the sunshine. She also loves her rawhides and plenty of toys. She gets along with other dogs and even cats. She walks well on a leash, knows some basic commands and hasn't had accidents in the house for quite sometime now. McKenna is now a part of a family with two children, enjoying her new home in Lafayette. Alice was originally estimated at about 5 months when she first arrived back in March, but may actually have been 1 -2 years already. She is a fluffy, gentle spaniel mix. Unfortunately Alice is looking for a great home once again at no fault of her own. She is a little shy upon a first meeting but will warm up quickly. She loves to play and also loves to cuddle. She gets along with everyone-- kids, cats and other dogs. She would make an easy fit into any household ready to share their love. Alice loves her walks and is also crate trained. Alice has gotten another chance at a forever home and is now living in San Francisco. Mama Blue is 5-6 year old pit mix who loves all people and even does great with children as young as one. She is a real love who just wants to curl up or even lay in your lap if you'll let her. She walks well on leash, has great house manners, and respects her caretakers. Due to Mama's unfortunate past she should be the only pet in the house at this time. She was confiscated from a home down south near Bakersfield along with her three pups. One pup was adopted through the shelter but Mama and her two babies had run out of time. They spent over a month in the shelter waiting for the case against their previous owner to close. He was convicted of animal abuse/neglect. Copper's Dream agreed to take her two pups but after meeting Mama and being greeted with the biggest pittie smile ever, there was no way she was going to be left behind. Everyone was well aware of what her fate would be if Copper's Dream did not take her. One smile from the most loving and loyal dog you will ever meet was all it took, in the van she went on her way to a better life in SF. After observing Mama's behavior outside the shelter environment it is clear that she does not like some dogs. We have no idea what her life was like before she came here, but after speaking with some trainers it is believed that she is just extremely under-socialized. Basically she never knew life outside the yard she was rescued from. Thanks to the help of Best Friends Pet Resort in Patterson, CA and the volunteers at Westside Animal for Adoption, Mama Blue has finally found that special forever home she deserves! Harry is an approximately 1-year old black Labrador retriever mix, weighing about 45 pounds, who was rescued from Merced. By the looks of his charming face, he has some Collie in him, just like his sister Daisy. He is super friendly and sweet, getting along with people and dogs alike. An energetic pup, Harry will need lots of exercise to keep him happy and healthy. Harry will gets lots of love in his new home- he was adopted by a family in San Jose with two young girls. 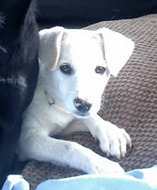 Austin is an approximately 3-4 month old yellow lab/terrier mix rescued from Merced. He is currently no more than 10lbs and will probably be somewhere around 40lbs when full grown. He is a sweet boy who loves to give kisses and will roll over for belly rubs when you come to greet him. He is quickly picking up potty training and makes an amazing cuddle buddy. Austin is now cuddling to his heart's content with his new family in San Francisco. 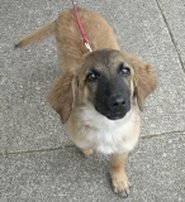 Lulu is a medium sized girl at about 6-8 months old. She was found as a pup on the streets of Taiwan with a broken leg and so emaciated that she could barely stand. That was over six months ago and Lulu has made an amazing recovery. She absolutely loves people and gets along fine with other animals. Lulu's good fortune continues! She has found her forever home in San Francisco. Bug is a 12 month old shar pei/pit mix with a giant heart just exploding with love. He is extremely smart and listens well to direction. He has great leash manners, knows sit and can stay for short periods of time. He is house trained and loves his kennel. With the simple command "kennel" or point of a finger and he will gladly go in for some R&R. Bug has lived with cats in the past and after the first excited introductions he does fine with them. He is still working on the proper way to interact with other dogs, but can and has lived with them in the past. Bug will need an active household who can provide him with plenty of regular exercise. He loves to go for walks, runs or even bike rides. He also loves to play fetch and has even learned how to toss the ball himself. Bug came to Copper's Dream extremely under socialized and scared of almost everyone and everything outside the home. It has been a truly rewarding experience to see him come such a long way. This special, deserving boy has found a wonderful home in Santa Clara. Foxy Roxy is a loving, 1- 2 year old female terrier mix (imagine a basenji/jack russell mix... we know, "unique") and possibly shar pei, rescued from being euthanized at the Los Banos shelter. She's very good with people, including older children, though she is sometimes cautious at first with men. Probably because of a lack of training and socialization during puppyhood, Foxy does have some issues interacting with other dogs. With submissive dogs and young puppies, she does very well if introduced to them properly and can live with them in the same household. However, as a very strong alpha personality, Roxy cannot be placed in a home with another dominant dog. Like a good terrier, Roxy has occasional energetic playful bursts, but for the most part is even-keeled and very loving. Her favorite past-time is running up and putting her head in your lap and looking at you with her big brown eyes so you will shower her with affection. Roxy nuzzled her way into the hearts of her foster parents and will now get to stay on in San Francisco as a permanent member of the family. Leon is one of Vida's adorable puppies. This charming guy was adopted and is now living in San Francisco in his forever home. Charlie is one of Vida's adorable puppies. This sweet guy was adopted by a family with five children in Rohnert Park. Sweet little Lucy is one of Vida's puppies. She definitely hasn't let her size hold her back against her big brothers! She is now living a happy life in Redwood City. Blossom is a 6/7 month old terrier mix who was found abandoned in Merced tied to a bike rack. Despite this misfortune, she is a happy girl who gets along with dogs and LOVES people. She just wants to cuddle. She is a little wiggle worm who just loves attention. She greets everyone with a wagging tail and big smile. She also knows some basic commands and is housetrained. Blossom was adopted along with Copper's Dream pup Reilly by a family in Palo Alto with two young girls. Reilly is a 5-month old terrier mix rescued from Merced. She is a tiny gal, weighing just under 10 pounds. 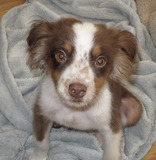 She is an energetic pup who is very playful and loves to be showered with attention. 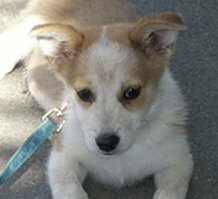 Reilly was adopted along with Copper's Dream pup Blossom by a family in Palo Alto with two young girls. 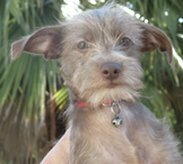 Meet Liam, a little wire-haired chocolate colored terrier mix who is as cute as a button. He was rescued from Merced and is about 4/5 months old. Liam is a little on the shy side still but does warm up and loves the attention. He would do great with another dog, since his personality really shines when other dogs are around. 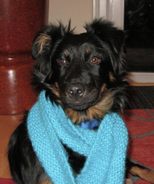 Liam has found his match with his foster mom in Redwood City where he'll be living with his new doggy siblings. Eli is a 4-5 month old terrier mix rescued from Merced. He has a beautiful soft smooth red coat with eyes to match. He does great with other dogs and loves to cuddle. He is still a little nervous outside with all the new noises but with gentle coaxing does well. He is currently no more than 10lbs so will probably mature at about 15lbs or so. He is a happy little boy who wiggles with delight when given attention. Eli will now be wiggling to his heart's content with his new family in Sunnyvale. Lottie is an approximately 2-month old Catahoula Leopard Hound mix rescued from Merced. She is a playful love-bug who loves affection. This energetic pup loves to play and will thrive with the all attention a young pup deserves. 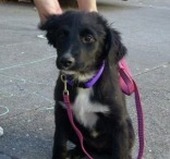 Adorable little Lottie now has a forever home in San Francisco. Meet Helen, a 4 month old lab/pit mix with a great personality. She has the perfect mix of playful energy and mellow cuddle time. She does great with other dogs and loves meeting new people. Her whole body wiggles with delight when people stop to say "hi." Helen will need regular exercise and continued training. Helen has found a great fit with a family in San Francisco. 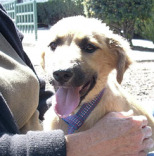 Dylan is described as a 3/4 month old great dane/shepherd mix. He is a BIG boy who will surely be 70+lbs. Although he is large, he is a gentle loving guy. He has a mellow disposition and does well with all people and dogs. His big floppy ears, giant paws and gawky legs give him a goofey appearance at this age but he will grow into it all soon. He is going to make a beautiful large dog as he matures, with a great brindle coat. Sweet Dylan is now enjoying his new family in Cupertino. 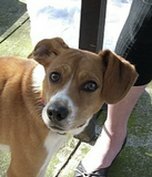 Petra is a 1-2 year old beagle mix who was found as a stray in Merced. 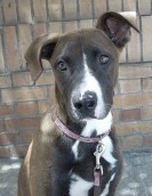 She is a gentle girl who gets along with other dogs and is even currently living with a cat and doing well. She walks well on a leash and loves her walks. She loves rawhides, laying in the sun and plenty of cuddling. Petra will get all cuddling she needs and more with her new family in Pacifica. Bridget is a 4 month old rottweiler mix rescued from Merced. She may be a mix of lab or hound as well, giving her a longer narrow snout. She is a solid girl, already about 25lbs, with beautiful dark brindle markings on her legs and face that give her a very unique appearance. Bridget is extremely well behaved for such a young girl and loves playing with all other dogs. She will require regular exercise to keep her happy. This great cuddle buddy has found a new home with a family in Sunnyvale. Winston is an oh so cute 4 month old pit mix, possibly lab as well. He has a great soft fluffy coat with adorable floppy ears. He gets along great with other dogs and even did well with the cat in his foster's house. He is a playful little guy who enjoys being around the family. He has been doing well in his crate at night and making great progress on house training. He walks fairly well on a leash for such a little guy and he learning sit already. He is very treat motivated so training should be easy for dear Winston. He now has a family of his own in Santa Cruz. Porter is a 2 month old ball of fluff. This little cutie was rescued from Merced as a stray. He was labeled as a terrier mix but looks very much like a cattle dog or even corgi mix with his shorter legs. Porter is just a baby so will need a family who can provide him with lots of attention and socialization at this important time in his life. He does fine with all people and doesn't mind other dogs one bit. Porter was adopted by his foster family, and is now living with kids in Daly City. 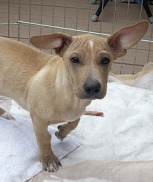 Pop is a 4 month old lab/dachshund mix who was rescued from Los Banos along with his brothers. 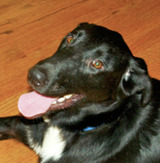 Pop is a friendly, playful boy who loves to go for walks and play outside. He is actually great at playing fetch and will drop the ball right at your feet. He walks amazingly well on leash for such a young pup. He does great with dogs his own size but is still a little fearful of the bigger ones. With more socialization he should come around just fine. Pop is also very stand-offish with most new people especially males. He is working on his trust issues though. He loves to cuddle and loves to be held, although he is quite the hefty little guy. He is doing well on his potty training and is adjusting well to his new surroundings. Pop will get to play and romp to his heart's content with his new family in Pacifica. 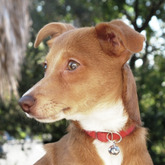 Carmen is a sweet, loving chihuahua mix possibly also Italian greyhound. She is estimated at about a year old. She loves meeting people and showers everyone with plenty of kisses. She gets along great with other dogs but can be submissive with larger ones. She also passed her cat test at the shelter and is an all around happy healthy girl. She walks great on leash and is picking up the house training pretty well. 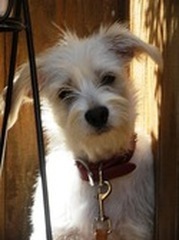 Carmen has been adopted by her foster in Palo Alto where she now has doggie siblings to play with. Norman is such a little cutie. He is estimated at about 7/8 months old and an Australian shepherd/Cocker spaniel mix. Although his perky fluffy ears, and size (about 10lbs) resembles that of a Papillon. He is on the submissive side and can be a little shy with new people at first. He is a great cuddler and loves hanging out with other dogs, both big and small. He has the softest coat with a great mix of colors. 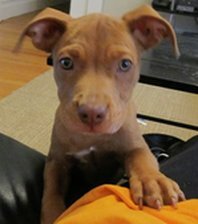 Norman is a playful happy puppy who now has a new home in San Mateo. 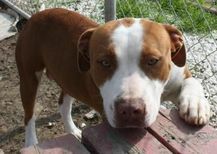 Gracie is a beautiful 2-3 year old pit mix who was rescued from Delano. She was rescued along with her pups who have since been adopted into loving homes. She now waits patiently for her forever home to come along. Gracie's sweet, gentle loving personality is what kept her alive in the shelter so long. She does great with other dogs and even doesn't seem to mind cats. She is housetrained, walks great on leash and knows her basic commands. She loves to romp and play outside, but knows when indoors it is time to settle down. Nothing seems to phase this girl, as she is always clam and loving in every situation. She has been great meeting all kinds of people including children. Gracie will surely bring you a lifetime of love and happiness to her new family in Novato. 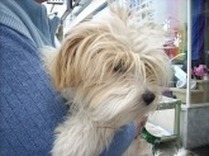 This adorable wire-haired little terrier mix is estimated at about 8 months old. He has loads of personality when he realizes that you're his friend. He can be a little shy at first more so with men, but does warm up. He is enjoys lounging in your lap and could spend all day there is you let him. Pierce loves the grass outside and watches- eyebrows arched- as you throw and retrieve his toy. Whether the concept of fetch is too silly for his sophisticated personality, or he just enjoys chasing you instead of toys. 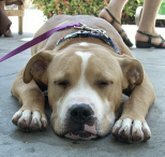 He found his happy home in San Jose in a family with 2 children and now they spend their days romping around together. Lovely little Lucille is a sweet white and gray pit mix, who is about 45 - 50lbs. She was rescued from a rural central valley shelter where her "owner" discarded her after she was no longer useful. She is probably about 2 years old and has clearly had a rough start to life. Although her spirit is in dire need of uplifting, her trust and love for humans has not been broken. She loves people and does great with dogs, but sorry no cats for this girl. She needs a home where she will be showered with love and given plenty of time to come out of her shell. She is on the shy side and currently a little jumpy with loud noises, but wants nothing more than to be able to play carefree and just be a happy girl. She walks great on a leash and is house and crate trained. She is also extremely gentle with all people, kids and even during play with other dogs. She would also do best with another doggie playmate to help build her confidence. It took a couple hours for her current foster sister Maggie to break through that wall, she was persistent and determined. It totally paid off and Lucy turned into a completely different dog. Now, Lucy is feeling the love in Menlo Park with her new family and her doggie sibling. 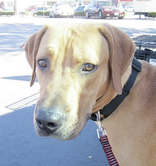 Duncan is a 7/8 month old hound/doberman mix who was rescued from Merced. Duncan is a big boy but extremely gentle. He is very much an old soul. He loves to give kisses and likes to be near you. He has a beautiful coat with very unique brindle markings. Duncan does fine with other dogs but can be a little shy meeting new people and in new situations. He is a quiet boy who just needs some love in his life. Duncan has been adopted by a family in Davis and is thrilled to have a new human brother and a really cool mom who takes him along to work at her yoga studio. 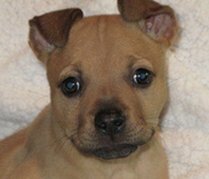 Nora is a 3 month old lab/pit/bull terrier mix who was rescued from Merced. She is a sweet girl with a gentle disposition. Nora has completely come out of her shell and is a very outgoing friendly pup. She loves to play with other dogs and loves all people. She loves spending time in crate, walks well on a leash and is learning her basic commands. She is also making great progress with potty training. 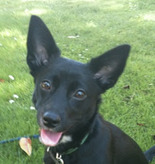 Nora would make any family the perfect companion and she found her lucky family in San Francisco. Quincy is an 11-month old boy who was rescued from Bakersfield back in November. He has recently found his way back to Copper's Dream and is currently looking for a loving home. The shelter labeled him as a pit mix but it is pretty clear when looking at him and his siblings that border collie has got to be his main breed. He is a sweet boy who is a little on the shy side when meeting new people but does warm up quickly. He loves to be with his family and a part of the happenings and will need regular exercise to keep him happy. He gets along fine with dogs and does great with kids. He is house trained, crate trained and knows all his basic commands. He walks great on a leash as well. Quincy is now making another family very happy in San Francisco, where he lives with three little girls. Snap is the smallest of the three dachshund/lab/chihuahua mixes. He is a super sweet boy who loves to cuddle and be in your lap. He is a little shy with new people and places but does warm up. He loves to play tag with you and loves to run around outside in the fresh air. He walks well on a leash and is doing well with potty training. 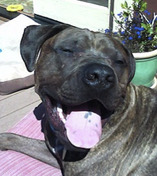 Snap was adopted by his foster in San Francisco and will have lots of fun playing with another dog in the home. Crackle is a 4 month old dachshund, mixed possibly with lab and chihuahua. He can be a little shy at first but does warm up quickly. New dogs can make him a little nervous but he will get over that with time. He walks great on a leash and loves to cuddle. He loves to play with his toys and loves to run around outside. Crackle has found a loving home with a family in San Carlos. 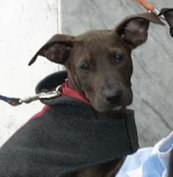 Lilo is bull terrier/lab mix who was rescued along with her brother, although labeled by the shelter as a pit/lab. She is a sweet girl who loved all the attention she was getting at the adoption event. She is great with all people and does fine with other dogs. She is a playful, loving girl who has found her permanent home with her foster family and doggie sibling in Benicia. 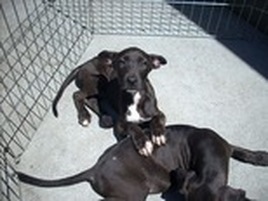 Stitch is a 3 month old bull terrier/lab mix who was rescued from Merced, although labeled as a pit/lab by the shelter. He is a happy boy who gets along great with other dogs and loves kids. He didn't even mind being carried around by the young kids in his foster home and he received plenty of visits throughout the day from all the neighborhood kids. He sleeps peacefully in his kennel at night and is coming along with potty training. He quickly learned to interact properly with other dogs, and took on the submissive role with the alpha female in his foster home. Stitch was adopted by a family in Milpitas where he'll delight in playing with their children and other dog. 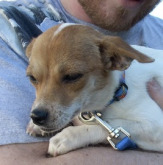 Tina is a 4 month old chihuahua mix rescued from a rural central valley shelter. She is a great girl who is eager to meet everyone and loves the company of other dogs. She has great markings on her soft white coat. If you are looking for a pup who is eager to please and ready for any adventure, Tina is your girl. 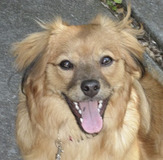 Tina was adopted by her foster and now lives in Redwood City with another chihuahua mix. Poppy is a 3 month old shepherd mix who was rescued along with her sisters, Clover, Lilac, and Ivy. Poppy's sweet shepherd face and adorable floppy ears, combined with her great personality made her irresistible to her foster. Poppy will be staying on in Crockett with the people who took such good care of her after life in the shelter. Candice is 8 - 10 months old and a total sweetheart. She was given the unfortunate label of pit mix by the shelter, but her amazing mellow temperment, some what droopy jowls and adorable underbite indicate she may be an american bulldog mix more than pit. Candice went from a stressful situation of an over crowded shelter to another stressful situation of a busy adoption event and took it all in stride. She greets everyone with a smile and politely sits for a good head scratch. She is gentle and loving with everyone, even small children who just can't resist coming to say hi. She gets along great with other dogs and when passing them on the street barely seems to notice them. This laid-back pup now lives with a couple in San Francisco. Chester is a 4 month old pup who we believe resembles more of a bull terrier mix than a pit bull mix, which is what the shelter labeled him as. He has a soft, sleek dark chocolate brown coat with the sweetest most soulful eyes you will ever see. He has a gentle loving personality and just wants to be with you. He loves playing with his toys and other dogs. He has been great meeting all kinds of different people and is quickly learning great leash manners. He also also been doing great on his potty training and now goes to the back door when he needs to go out. So smart for such a little guy. Chester is now relishing in all the love and attention he's getting with his new family in Hayward. 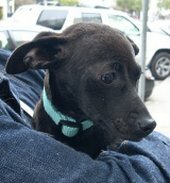 Toby is an adorable 4 month old black lab mix who was rescued from Merced. He loves to play with other dogs and be close to people. Toby walks very well on leash and learns commands very fast (ask him for a "shake"!). He is a friendly, happy-go-lucky puppy. 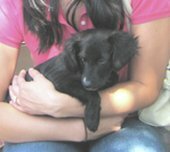 Toby has found a new forever home in San Jose with a couple and their two black labs, who are also rescues. Cody was adopted at 10 weeks old into a wonderful home with family with two young girls. He took to his potty training right away, slept through the night, and now gets to go with 'Dad' every day to work. Cody also gets to go to the soccer games, the park, and is socialized with all sorts of dogs as well as kids of all ages. Morris is an adorable 3 month old terrier mix. He was rescued from Merced where he was labeled as a pit mix but he looks a lot more bull terrier with his long nose and ears that eventually will stand straight up. Morris came in with his brother Chester. He is definitely the more outgoing pup out of the two and curious about everything. He loves to play with his toys and also loves attention from anyone. This cute little happy pup would make a great addition to any family. Morris is enjoying his new life in Salinas along with 2 doggie roommates. Sweetpea is one lucky little lady who was rescued from Bakersfield with just a few hours to spare. She is now about 4.5 months old. Although she was labeled as red heeler mix, we believe she may be part corgi with a slightly longer body and shorter legs. She is one sweet girl who is doing great with the kids in her foster family as well as her new doggie friends. After a rough start in life Sweetpea has finally landed in a great foster home and growing fast and getting stronger everyday. She loves playing with her toys and is just about having fun and taking naps right now. She is happy to report that she has found her forever loving family in Santa Rosa. 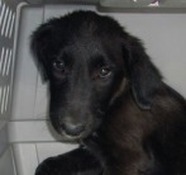 Ivy is a 3 month old black lab/shepherd mix who was rescued from Bakersfield. She came to us a little shy, but her outgoing personality is really starting to show. She is a loving girl who enjoys the company of other dogs and people. Ivy will be growing up alongside three girls in a Foster City family. Lilac is a 3 month old shepherd mix who was rescued along with her sisters. She is definitely the more submissive of the bunch and loves to just be near you. She does have her playful bursts, but right now she is more about cuddling. She does well with other dogs and was fostered with kids and has been great with them. Lilac has discovered the sweet smell of a forever home, and now lives with a family in Palo Alto. Clover is a 3 month old black lab/shepherd mix. She has a fluffy soft coat and beautiful white markings. She is one playful girl who loves goofing around and having fun. She is still learning how to walk on leash and other basic commands, but is coming around rather fast. She and her sisters where dropped off at the Bakersfield shelter, but luckily they were rescued by Copper's Dream and are now ready for their new life. Clover was adopted by a family in San Jose where she will have lots of fun playing with her new dog siblings. 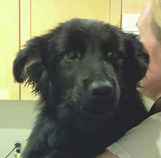 Carissa is a 4 month old black lab/shepherd mix who was rescued from a rural central valley shelter. She is a sweet girl who is on the submissive side and just loves to be with you or even in your lap. She does fine with other dogs and so far has shown she would do okay with cats. She loves to play, chase is her favorite, but at the same time knows when it is time to relax. She enjoys her walks and is doing really well with her leash skills. She also loves the water and after her bath she jumped back in the tub ready for some more. 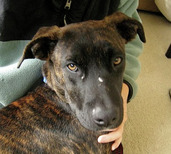 Carissa is a great girl who has a found a wonderful fit with her new family in Half Moon Bay. 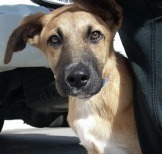 Jay is a 4 month old shepherd/lab (maybe boxer) mix rescued from a rural central valley shelter. He had been running loose evading animal control for weeks. His big floppy ears and cute bob tail just make him irresistible. He loves to shower people with affection and loves playing with other dogs. He can be a little shy at first with new people but will warm up with gentle coaxing. He is also very food motivated so training should be easy! Jay's runaway days are behind him and he now calls San Anselmo home, where he lives with an infant and toddler. 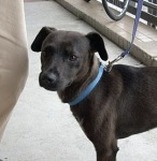 Corrine is a petite black lab/terrier mix with a gentle disposition. She is estimated at about 3 months old. She gets along well with other dogs and loves to play. She also enjoys the company of her human playmates just as much. She has an adorable tail that curls over her back and a super soft shiny black coat. Unfortunately, Corrine fell very ill only a few days after she was in our care. It seems she has a very moderate version of the parvo virus. She is expected to make a full recovery with her new family in Morgan HIll, and will have no long term health issues from the virus. 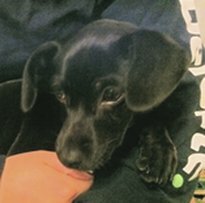 Bandit is a 3 month old mix from the Bakersfield shelter. The shelter listed her breed as Mastiff/Lab. Bandit herself refuses to be given any sort of label. She is a free spirit with a heart of gold! Always first into the breech, she is fearless in checking out new and unusual things and she always greets new situations with a smile on her face and a wag of her tail. Bandit's tail continues to wag happily at her new home in Woodside. 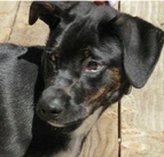 Max is estimated at about a year old and a lab/heeler/terrier mix. He is pretty much full grown and a perfect size at about 25 lbs. Max gets along fine with other dogs but can be a little shy with new people. He has been through a lot of change lately so just needs a little time to adjust. He is a sweet boy who walks well on a leash and is quickly learning his basic commands. He has a super soft brown/black coat with a small white speckled patch on his chest. He also does well in his crate and is on the quieter side. 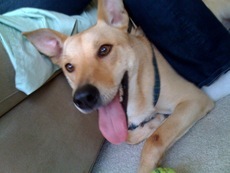 Max was adopted by a couple in Sunnyvale where he will be a beloved family companion. 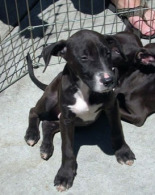 Muffin is estimated at about 5/6 months old and believed to be a bull terrier/pit mix. She was brought into the Merced shelter after she was confiscated from her previous home. Muffin's short body frame makes her look younger than she is, giving her a forever young appearance. She is super sweet and definitely wants to please. She is still learning the basics including proper play behavior with people but she will get it soon. She gets along great with other dogs and people. She also walks well on a leash. Muffin will now be having lots of fun with her adoptive family in Daly City. Gertie is a 9 month old pit mix with a great outlook on life. She is on the smaller side and is a great little compact package. She was found wandering around a Lowe's parking lot in Merced looking scared and confused. Gertie was one of the lucky ones since her great personality is what got her a longer stay at the shelter. Gertie loves everyone she meets and is a total social butterfly. She greets everyone with a wagging tail and puppy kisses. She also seems to be house trained. Gertie can now relax and enjoy life with her new family and their daughter in San Francisco. 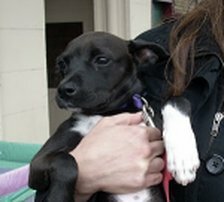 Tess is a cute black and white terrier mix rescued from Merced. She is about 5 months and around 15lbs. She is a sweet, gentle girl who gets along well with other dogs and people. Tess can now enjoy one of her favorite pastimes, cuddling, with her new family in southern California. Panda is a 3 month old mix from the Bakersfield shelter. The shelter had his breed listed as Mastiff/Lab. Whatever he is, he is one thing for sure: super sweet!! Plus he's very handsome! He loves to cuddle and follow the humans around and is very friendly with everyone he meets. An example of his sweetness: he let's his sister Bandit chew on his ears without much of a fuss. What a patient little boy! Panda is staying on with his foster in San Francisco where he'll be a loving, permanent fixture in the household. Rose is estimated at about 3 months old and believed to be a shepherd mix. She has a beautiful soft fluffy coat and long floppy ears. She also resembles a Belgian shepherd or Saluki. 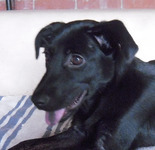 She is a sweet playful girl who does well with other dogs and loves attention. Rose is one happy bundle of joy who will require regular exercise to keep her happy and healthy. She now has a new forever home in Jenner with a couple and their senior dog. Moira is a sweet, quiet terrier/chihuahua mix. She is about 6 months old and as sweet as can be. She gets along well with other dogs and did very well interacting with numerous people at our adoption fair. She has even shown to be great with young children. She loves to cuddle and be held and loves her tummy rubbed. She also loves to get that puppy energy out but also knows when it is time to settle down. Moira's foster mom said she is the perfect puppy-- so much so that now Moira is an official family member, where she joins young kids and cats at their home in San Francisco. 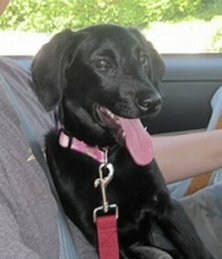 Bailey is an adorable 3 month old black lab mix with a great personality. 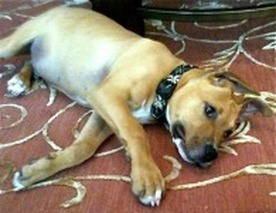 She adjusted very well to her foster home and showed great signs of being a quick learner. She loves to go for walks where she can meet new people and dogs. She really enjoyed her bath so she will probably love the water! She also loves her down time, cuddling and belly rubs. Bailey has found a new home in San Jose with a family and their three teenage children. 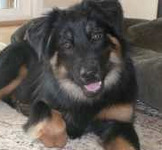 Ingrid is estimated at about 3/4 months and a lab/shepherd mix. She was found as a stray in Merced. She will definitely be a 50lbs+ girl, but is a lover. If it was up to her she would be your lap dog. She loves attention and can't get enough belly rubs. She likes to be with you but is not overly in your space, as long as she can watch over you she is happy. She also does well with other dogs and all people. She is a very outgoing girl. She seems to have already gotten the hang of waiting to go potty outside and quickly learned how to play properly with the small chihuahua in her foster home. She will need regular exercise, since she is one playful pup. Ingrid will now get attention and love galore with her new family in San Francisco where she'll be the only pet. Rudy is an adorable tan and white scruffy terrier mix at about 10 months old. He was a little nervous when he first arrived and literally rapped his arms and legs around his foster mom and wouldn't let go. He has been slowly coming out of his shell and making great progress. He does well with other dogs and loves his cuddle time. 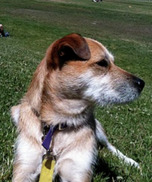 Lucky for Rudy, he is now living with another pooch and a new family in San Francisco. Sally is a sweet, quiet 4 month old chihuahua mix. She is a little timid at first but will warm up. She loves a nice lap to cuddle in and is completely content just being in your arms. She does fine with other little dogs but currently is still a little unsure of the big guys. She will need a family who will give her the time she needs to open up and be her true self. Sally found that family with a couple in San Francisco where she'll get all the lap time she deserves. 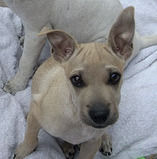 Maggie and Katie were 3 months old when they were some of the lucky pups rescued from Merced. 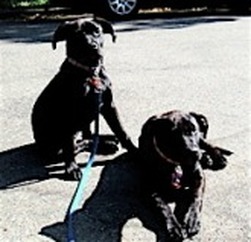 These two pups were happily adopted together by their foster in Mill Valley. 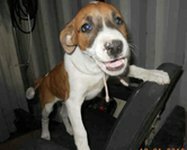 Felicity is a playful happy girl estimated at about 2 months old. 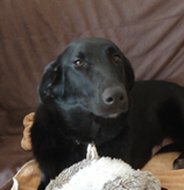 She is a black lab mix and is extremely lucky to be alive. This little baby girl was dumped over a 10 foot fence surrounding the Wasco Shelter sometime in the middle of the night and left to fend for herself. The Wasco Shelter is in a very rural area with lots of wildlife around, she is very lucky to have made it through the night. She is so happy to be in a loving foster home and greets everyone with a wagging tail and many kisses. She loves playing with other dogs both big and small and loves to curl up with you for a nap. This happy girl has found a loving home in San Carlos. 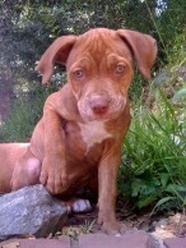 Cash is a pit mix pup rescued from Merced. He may possibly be mixed with shepherd giving him those cute pointy ears. He is a sweet boy who gets along with other dogs and loves people. He is EXTREMELY social. He has plenty of puppy energy to burn, so will need plenty of exercise and would do best with an active family. We are happy to say he found that active family! His foster folks and their children fell in love with him and Cash goes everywhere with them. Norie is an approximately 1-year old labrador/pit bull mix who has a beautiful white coat with cute brown speckles all over. She is one of the sweetest and most loving dogs we have ever met! She is gentle and friendly with everybody she meets and is very obedient. She is also very submissive and will always greet you with licks and roll over on her back for a tummy rub. She loves to go on adventures to the dog park or anywhere else you will take her. Norie is also very good with her recall and will always come back to you as long as she can get a pet or a piece of hot dog! At home, she is a total couch potato and wants nothing more than to sleep or lay by your side. She will also follow you everywhere you go and give lots of sweet doggie kisses. Norie's newest foster in San Francisco couldn't imagine life without this darling girl, so Norie has found home sweet home. Spring is a sweet, happy little pit mix, and one of Gracie's four baby girls. 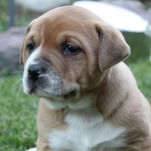 She has a beautiful dark red coat with faint brindle markings and tons of adorable wrinkles. When she was younger her legs looked like a slinky, hence the name "Spring." Spring was adopted by a couple in San Mateo where she'll get to grow up with lots of love and attention. Jonah is a strikingly handsome 6 month old red and white border collie/lab mix. His good looks aren't the only things going for him. He has a great personality to match. Jonah does great with other dogs and usually takes the submissive role. He also walks well on leash and is very eager to learn. He loves to run around and play outside just as much as he loves to cuddle. He is currently about 30lbs, so he will be a medium to large size dog when full grown. 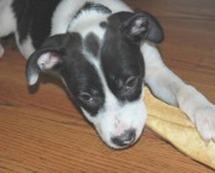 Jonah will need an active family ready to give him plenty of exercise; he is a border collie after all. Lucky for Jonah, his foster dad's uncle heard about this special pup and invited him to come and romp in Washington, D.C. Maybe he will run into First Dog Bo. 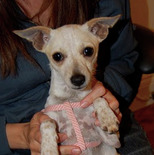 Kristi Lou is estimated at 1-2 years old and is a chihuahua. She was saved along with her four pups from Merced. Kristi Lou is a sweet girl who is outgoing and gets along fine with other dogs. She has been a great mom and is now ready for a break and new loving home. She is a total lap dog and loves to curl up in your lap and cover you with kisses. She is also gentle with children and extremely quiet in the house. She has decided to stay with her foster family and looks forward to all of their future travels together. 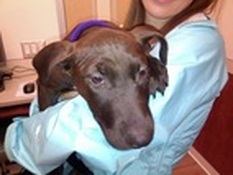 Tenley is a beautiful chocolate lab mix who is estimated to be about 5/6 months of age. She is a sweet, gentle girl who was rescued from Merced. She gets along with other dogs and just wants to play, play, play. She is also very gentle and sweet with the humans she meets. She walks well on a leash and likes to stay right by your side. She is a solid girl and probably already weighs about 35lbs. Tenley will get to play to her heart's content with her new family in San Jose. More to be uploaded soon!